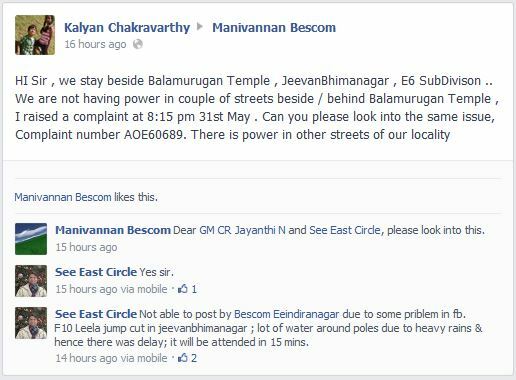 One man from the Bangalore Electricity department (BESCOM) has redefined the usage of Facebook for solving public grievances. We have already seen the Bangalore City Police, Uttar Pradesh Police and Chandigarh Traffic Police use Facebook to issue their complaints. After the police and traffic departments, it is the electricity department that has used the online social media space to lodge complaints. Unlike the others, this usage is not driven by a Facebook Page but rather a Facebook Profile. 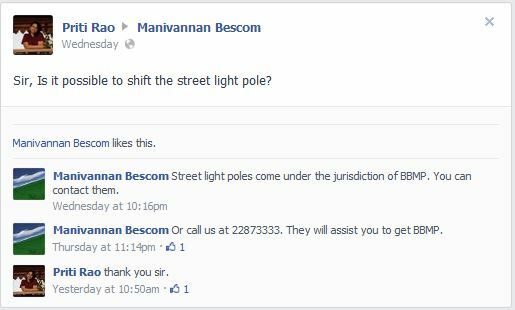 P. Manivannan, the Managing Director of BESCOM, uses Facebook to solve electricity problems of the common man. With an aim that no household in his ambit should have power cuts, the man first introduced a telephone helpline to address the concerns. After that, he got his entire team on Facebook and traces the status of complaints on the public platform. What is the mission? All complaints should be solved in 60 minutes. Other complaints looked into prolonged power cuts. And the process involved had the MD tag his team members and people responsible for the task. Even their response was quick and action oriented. As seen the tone is conversational and at the same time authoritative. The idea is to get things done as soon as possible but at first the person is also assured that it is indeed going to happen. The issues on both the ends are shared hence explaining why is there a delay if there has been so. Apart from addressing woes, BESCOM’s MD also uses the platform to spread news regarding major faults and power cuts to avoid clogging of the telephonic helpline. He also uses Facebook for creating other general awareness regarding the organisation and the processes in general. 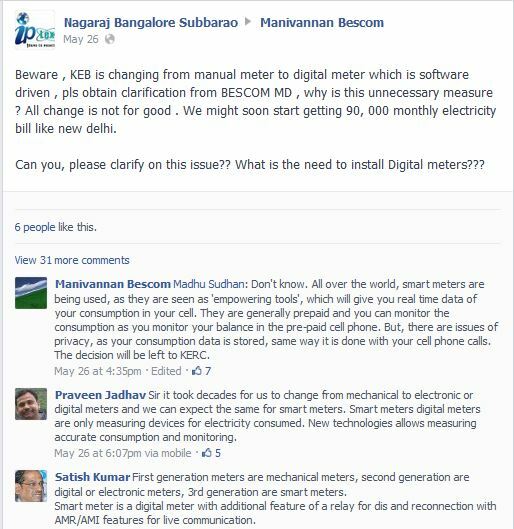 One post that talked about how electricity reaches your home in Bangalore went viral over the internet. HOW DOES Electricity generated at Raichur Thermal Power Plant (RTPS) comes to your home in Bangalore? It’s interesting and important to know how Electricity reaches your home. It may explain you why the supply is cut-off at times, and it will also enable you to advise/suggest us ways for improvement. The electricity generated at RTPS (or any other station) reaches your house in five steps. You can read all the entire post here. What is commendable here is that it is one man’s initiative that is making a difference. Though it’s on a social media platform, the issues are addressed and this is done efficiently. Why does Facebook make it special? All conversations, queries and complaints are in the public domain for the world to see. If there is a delay, everyone will know. If there is efficiency, everyone will know again. No one wants a delayed issue going viral over the internet. Also, Facebook has turned out to be a convenient platform. When phone lines are jammed, writing a Facebook post is easier than writing an email. It also has higher chances of being addressed sooner. It’s a trend of bringing transparency into departments that otherwise have never been so. A positive step in terms of meeting deadlines and creating a more successful system. 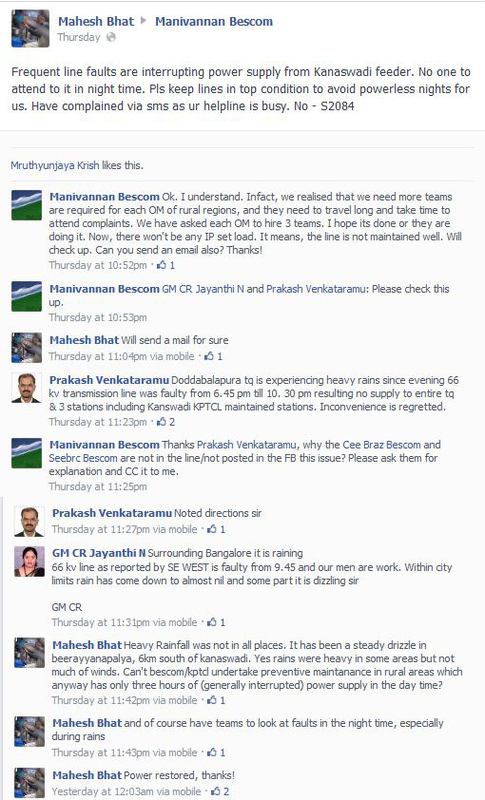 We applaud the efforts of Mr. Manivannan and his team. Hopefully, BESCOM can be an inspiration for many! Already inspired? Check out P. Manivannan’s Facebook profile here.